Three amicus curiae (“friend of the court”) briefs were filed Monday (4/8/19) in the Maryland Court of Appeals in support of Adnan Syed, who is asking the state’s highest Court to reconsider its opinion denying him a new trial. This is an extraordinary show of support from local, national and international organizations that respectfully ask the Court to take another look at this case. Each group expresses concern that the Court of Appeals decision will have unintended adverse consequences for the wrongly convicted. Because the rule governing motions for reconsideration does not address whether amicus briefs can be considered at this stage, each brief is accompanied by a motion asking the court for leave to file. The Court has not yet ruled on these motions. One of the briefs is filed on behalf of the international Innocence Network and the MacArthur Justice Center in Washington, D.C. It is authored by Elaine Goldenberg, Dahlia Mignouna and Jeremy Kreisberg of the law firm Munger Tolles & Olson. You can read that brief HERE. Another brief is filed on behalf of the National Association of Criminal Defense Lawyers. It is authored by Jessica Amunson, Lindsay Harrison and Caroline Cease of the the D.C. firm Jenner & Block. You can read that brief HERE. and Douglas J. Wood. This brief is authored by Steve Klepper of Kramon & Graham and others. You can read that brief HERE. This morning we filed our Motion for Reconsideration, asking the Maryland Court of Appeals to reconsider its ruling denying Adnan Syed a new trial. These motions are always long shots, but we feel we have raised valid reasons for Maryland’s highest court to to take one more look at this case. You can read the Motion HERE. Let us know what you think and thank you for your continued support! We are devastated by the Court of Appeals’ decision but we will not give up on Adnan Syed. Unfortunately we live in a binary criminal justice system in which you either win or you lose. Today we lost by a 4-3 vote. Our criminal justice system is desperately in need of reform. The obstacles to getting a new trial are simply too great. There was a credible alibi witness who was with Adnan at the precise time of the murder and now the Court of Appeals has said that witness would not have affected the outcome of the proceeding. We think just the opposite is true. From the perspective of the defendant, there is no stronger evidence than an alibi witness. Syed today filed a brief providing the Maryland Court of Appeals with supplemental authority pertaining to the alibi issue now before the State’s highest court. The supplement alerts the court to a new case from Alabama’s highest court called Ex parte Gissendanner, No. 1160762, 2019 WL 101611 (Ala. Jan. 4, 2019). Why do we care about what an Alabama court is saying? The reason relates to the argument initially set forth by a dissenting judge from the Court of Special Appeals, and now adopted by the State in the current appeal. The dissenting judge, and now the State, have argued that another Alabama case, Broadnax v. State, 130 So. 3d 1232 (Ala. Crim. App. 2013), should guide the Court of Appeals as it deliberates on the alibi issue. Broadnax is a case that contains some reasoning not favorable to Syed. However, the new case, from the Alabama Supreme Court, cuts the legs out from under Broadnax. Gissendanner affirms the arguments and principles Syed has been making all along: that it was ineffective assistance of counsel when trial counsel, Cristina Gutierrez, failed to investigate a key alibi witness prior to trial. Before Gissendanner, Alabama was an outlier in this particular area of the law. Now, Gissendanner brings Alabama closely in line with the overwhelming majority of jurisdictions. Our recent filing can be found HERE. The briefs are all in for what is probably the final appeal of the Syed case — to the Maryland Court of Appeals, the highest court in the state. You can read our filling, which addresses the cell tower issue, HERE. Oral arguments are set for November 29 at 10 am. They will be streamed live from the Annapolis courtroom (go to the Maryland Court of Appeals website). The Maryland Criminal Defense Attorneys’ Association and the Maryland Office of the Public Defender jointly filed an amicus curiae (friend of the court) brief today in support of Adnan Syed. The brief, authored by Steve Klepper, of Kramon & Graham, is also signed by a group of 16 long-time Maryland criminal defense attorneys. The brief addresses, among other things, the duty of defense counsel to investigate an alibi witness. The brief is available HERE. Today we filed our brief on behalf of Adnan Syed in the Maryland Court of Appeals. To recap, we won a new trial for Adnan more than two years ago. Since that time the State of Maryland has been appealing the ruling granting the new trial. First the State appealed to the Court of Special Appeals (and lost). Now they are appealing to the Court of Appeals, which is the highest court in Maryland. The State, as the Appellant, filed the first brief a month ago. Today’s filing is our response. You can read the filing HERE. First, sorry for the lack of updates on this page. We’ve been busy. There are some developments to report in the Syed case. The Court of Appeals of Maryland — the highest court in the state — has agreed to review the decision of the Court of Special Appeals (which upheld the trial court order granting Adnan Syed a new trial). The Court of Appeals will consider both issues that were before the lower courts: the alibi issue and the cell tower issue. When this appeal is completed — probably about a year from now — the state appellate process will be complete. Barring some unusual event, the only place to go after that will be the United States Supreme Court. We are frustrated that this process has dragged on so long. Syed was granted a new trial more than two years ago, yet he remains in jail. But there is nothing we can do about this; it is the system we live in. The good news is that the last stage of the state appellate process should go relatively quickly. A briefing schedule has already been issued (HERE), and it is expected that oral arguments will take place the first week of December. We just filed (today) our Opposition to the State’s Petition for Writ of Certiorari, and our Conditional Cross-Petition. In this filing we do two things. First, we argue that the State’s petition for writ of certiorari should be denied because that State has presented a fact-based issue that is not meritorious of review. In fact, the facts of this case do not even support the State’s “Issue Presented.” Second, if the State wants to appeal the alibi issue (which we won at the Court of Special Appeals), we are suggesting that the Court of Appeals re-consider the cell tower issue (which the Court of Special Appeals denied on waiver grounds). Today the State filed a petition for writ of certiorari with the Maryland Court of Appeals. Essentially, the State is asking Maryland’s highest court to allow it to appeal — once more — the decision to grant Adnan Syed a new trial. This move by the State does not come as a surprise to us. The State is appealing the alibi issue, in which the Court of Special Appeals found that Adnan’s trial counsel was constitutionally ineffective for failing to investigate the alibi witness Asia McClain. The flip side to the State’s latest appeal is that we can also appeal. If we choose to do so, we would file a conditional cross-petition for writ of certiorari. We would be telling the court that, if it reviews the State’s issue, we would like it to also review the cell tower issue, which was denied by the Court of Special Appeals on the grounds of waiver. We would have to file within 15 days of today. When the judges of the Court of Appeals receive both petitions, they will vote and reach a decision as to whether they will hear either the State’s issue alone, both issues, or nothing at all. In normal cases it is difficult to get a petition for certiorari granted. While we appreciate and respect the State’s right to keep appealing, we are eager to take the case to trial and give Adnan the fair trial he is guaranteed under the Constitution. We expect the mandate to issue today in the Court of Special Appeals’ ruling affirming the Circuit Court’s granting of a new trial for Syed. If it does issue today, the State would have 15 days to file a petition for writ of certiorari to the Court of Appeals, which is the highest court in Maryland. If the State does seek cert, which it has not yet said it would, Syed could file a “conditional cross-appeal” challenging the part of the Court of Special Appeals ruling that went against him. If the State does not file a petition for certiorari, the case would move down to the Circuit Court (trial court) and be set in for a new trial date. We are humbled by all of the support that has poured in from all over the world. It’s been amazing to experience. We have been inundated with questions about what is going on in the Adnan Syed case. Here is the latest: We are still waiting on the Court of Special Appeals to issue an opinion. Oral arguments were held on June 8, 2017, so it has been almost 10 months. The Court of Special Appeals is being asked to review the order by Baltimore City Circuit Court Judge Martin Welch granting Syed a new trial. The Court of Special Appeals is the second highest court in Maryland. Above it is the Court of Appeals. We are hopeful that the Court of Special Appeals will rule in our favor and that it will not be necessary to seek additional appellate review. But, for now, all we can do is wait and see. Of course, as soon as we have an answer from the Court of Special Appeals, we will make it public. After Adnan’s conviction was vacated, we filed a motion seeking his release prior to a new trial. The State of Maryland opposed. We argued that, because Adnan’s conviction was no longer in tact, he should be right back in the place he was before being tried and convicted in 2000. Thus, he should at least be able to go back to court and fight for bail, particularly because, we argued, he was not a flight risk and he was not a danger to society. He should have been given the same chance as someone who still had a presumption of innocence. The State argued that there was a higher bar to Adnan being released. In the State’s view, the Court should have applied the standard it uses for a person who has been convicted and who applies for bail pending an appeal. Maryland law is not clear on the question of what standard applies to someone in Adnan’s specific situation. However, the Circuit Court ruled for the State and refused to let Adnan come to court for a bail hearing. We then appealed the Circuit Court’s decision to the Court of Special Appeals, but the appellate court did not grant us “leave to appeal.” With this denial there was nothing else we could do. Thus, Adnan, remains in prison. 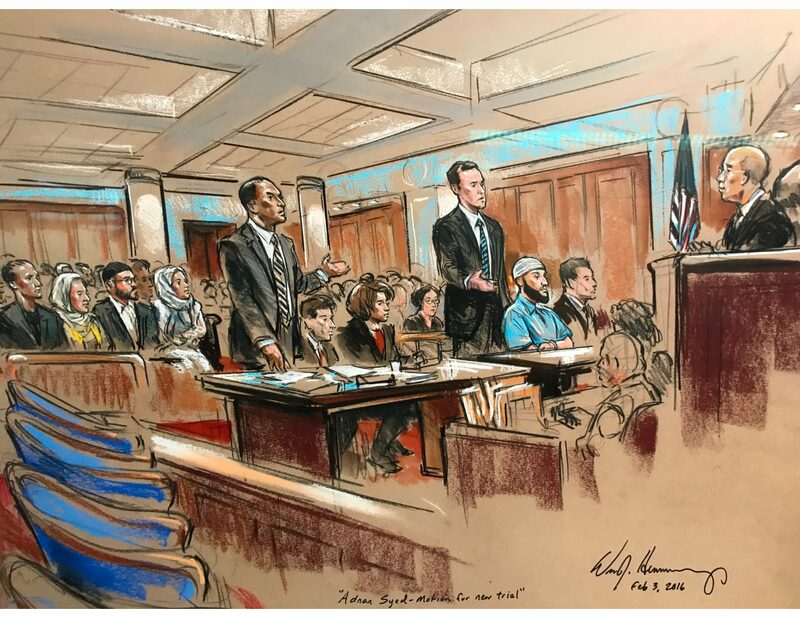 Here is the latest on the Syed case: In the summer of 2016, Judge Welch granted a new trial for Adnan. This came after Adnan’s post-conviction proceeding was re-opened. Judge Welch granted the new hearing on the cell tower issue; he found that Adnan’s trial attorney, Cristina Gutierrez, was constitutionally ineffective for failing to cross-examine the State’s cell tower expert with an AT&T document that severely undermined the reliability of the State’s cell tower evidence. In the same opinion, Judge Welch also denied Syed’s alibi claim. He found that Gutierrez was deficient for not investigating or contacting alibi witness Asia McClain, but that the failure to do so did not prejudice the trial. The State of Maryland appealed the granting of the new trial (and Syed appealed the denial of the alibi claim). The parties briefed the issues and the Court of Special Appeals (a panel of three judges) held oral arguments on June 8, 2017. We are now awaiting the Court of Special Appeals’ decision. As soon as an opinion is released, we will make it public.